"A fascinating early nineteenth century English antique pottery arcaded dish circa 1810-20. 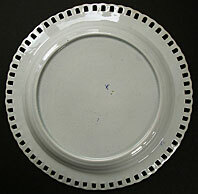 The pattern is known as Gothic Castle and is a classic original pattern produced by Spode. Most pieces found are unmarked although this example has a workman's mark in underglaze blue. The pattern is interesting: transitional with the European gothic castle set in a Chinese style landscape with figures and an overlarge flowering plant in pot - a typical later chinoiserie motif. This rare and special example of best antique English blue and white transfer printed pottery is in great display condition." Antiques Expert Hamilton Bear. 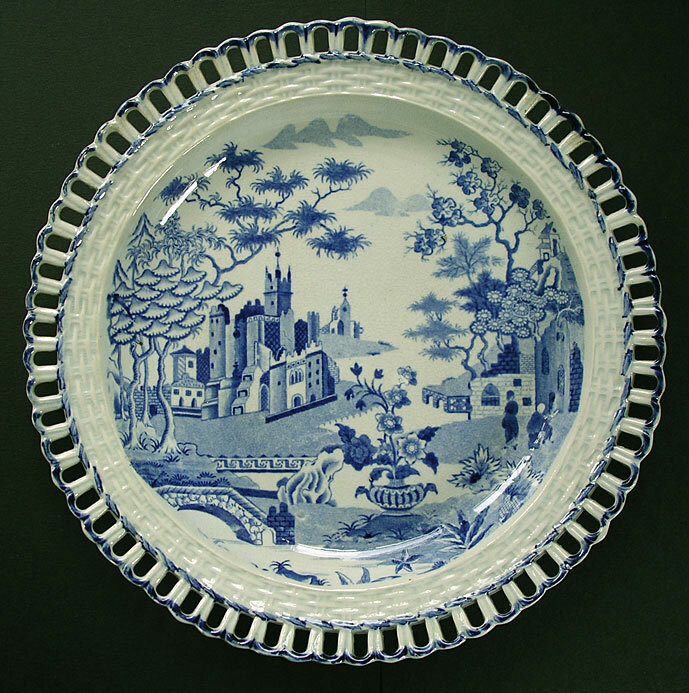 References: Another Gothic Castle pattern dish is illustrated in Blue and White Transfer Ware 1780-1840, A.W. Coysh plate 158 page 105. Dimensions: width 186 mm max. 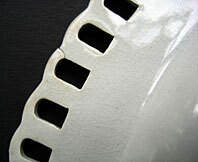 Marks: workman's mark in underglaze blue. Condition: Overall an excellent piece of antique pottery with no damage or restoration. There are two tiny firing cracks to the arcaded rim which were decorated over to the front and are difficult to spot. Typical clean light crazing to glaze which is only clearly apparent in magnified view. This is a good example that displays well.